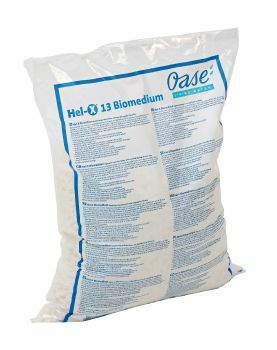 Following rigorous Research & Development, OASE Engineers in Germany have successfully re-developed the Hel-X Bio Media to further increase its biological settlement surface area by an additional 13%, resulting in the launch of Hel-X 13 Biomedium. Hel-X 13 consists of individual housings which allow beneficial aerobic bacteria to settle and breed inside the protected casings, helping to biologically break down soluble waste within the OASE ProfiClear Premium Moving Bed Filter Modules. Hel-X 13 allows a greater amount of bacteria to be contained within the same filter volume, resulting in more rapid breakdown of food and fish waste within the filter system. 25 Litres of Hel-X 13 Biomedia now has the capacity to biologically break down 170g of food/day.